It is no secret that the African bush, it's wildlife and the people are very close to my heart. 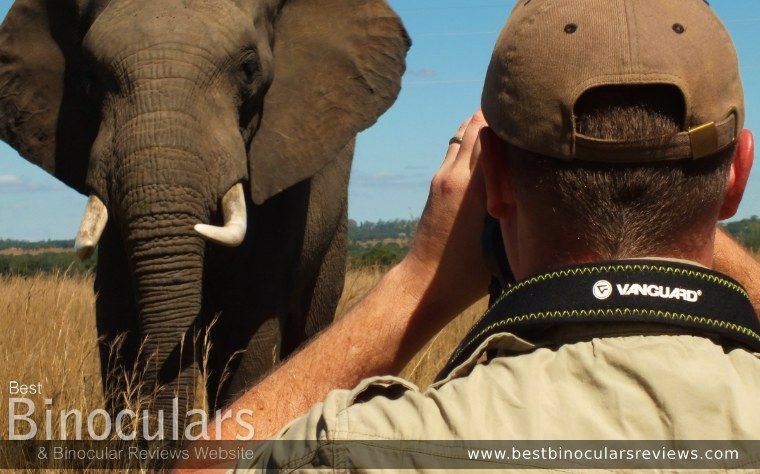 I would say that binoculars are one of the most important, if not the most important pieces of equipment that a safari guide should have with them at all times. 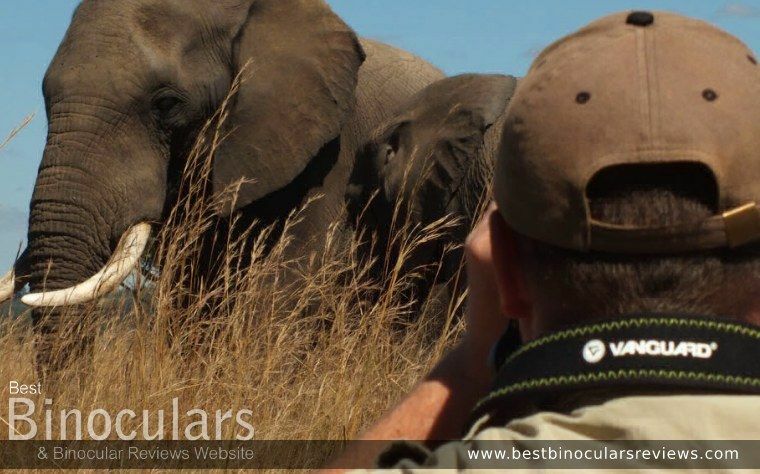 So it stands to reason that if good safari binoculars are important to a professional, then they will also be as important to those wanting to get the most out of their safari holiday. 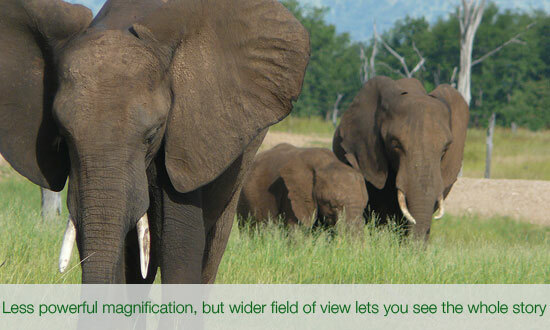 In my opinion, the right choice of optics can drastically improve your safari holiday experience. 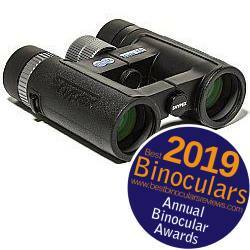 So in this guide I hope to pass on some of my knowledge gained from working as a guide and from all the years that I have been testing and reviewing binoculars here on BBR. 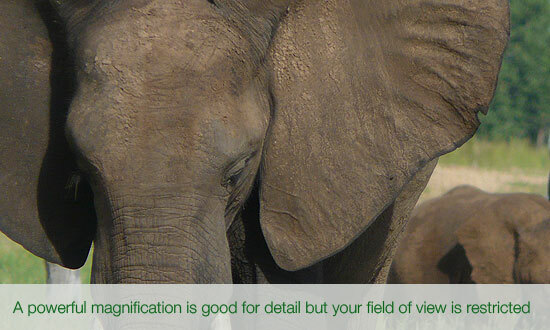 So just why are binoculars so important to the enjoyment of your safari holiday? 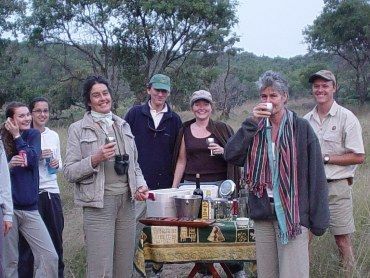 If this is going to be your first Safari experience then it is important to manage your expectations, the bush is not a zoo and for the most part you are not going to be sitting right next to the animal that you are viewing. Sure if you are lucky enough there will be times when you have a herd of elephants surround your safari vehicle or you may come up right close to a pride of lions sheltering from the midday heat in the shade of a tree. But there are all the other times where your guide may spot a leopard on the rocks in the distance or some giraffe on a far away plain where the right pair of binoculars will really make the difference. Then there are the birds, Africa has some of the most interesting and diverse birds found anywhere in the world and any keen birder will tell you that a pair of binoculars is essential for bird spotting. You may think "I'm not going all the way to Africa to see birds!" Believe me I have heard that one before, but if you give them a chance, birds are every bit as interesting as the big 5 on Safari. Who knows, you may even get to see vultures feeding on the leftovers of a wild dog hunt, or a Snake Eagle swoop down to catch it's prey. Wouldn't it be a shame to miss out on that because you either don't have a pair of binoculars, or if the ones you do have are not up to the task? 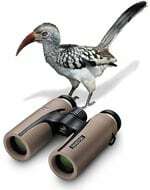 If birds are your main focus you may look for more specific birdwatching binoculars as apposed to all round safari binoculars. 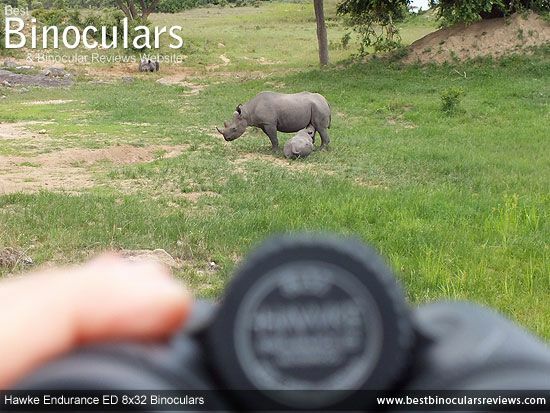 I use my binoculars even when I am sitting watching something like a rhino or even an elephant that is only 10 meters away (yes that is me in the photo below). Sure they are some of Africa's largest mammals and I can see them perfectly well with my eyes, but there is so much more to see. If it is a White Rhino, you can notice how square it's lips are, perfect for "hoovering" up it's staple food of grass. If it is a Black Rhino, look closely at it's pointed lips, perfect for reaching in amongst the branchlets of small bushes to find the sweetest shoots. With elephants, take a look at their eyes and eyelashes, so much like a humans. Binoculars can take you that one step further, from just seeing the animal, to observing their behavior. It will truly transform your safari holiday experience! 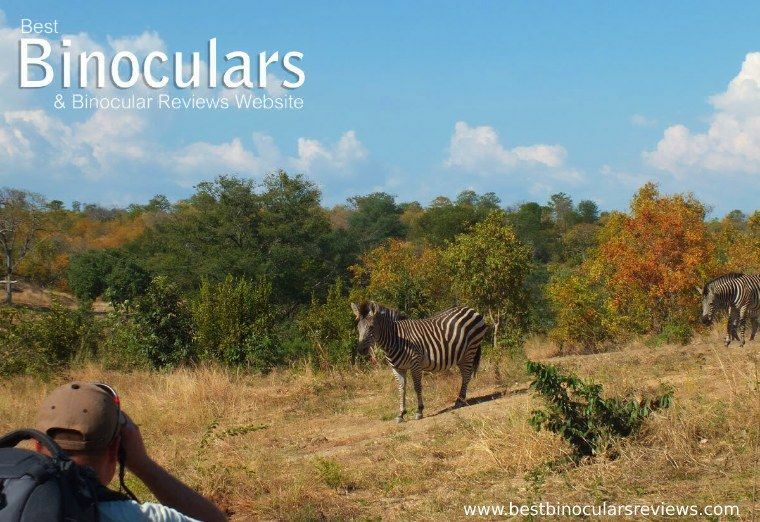 What makes a Good Binocular for Safari? So you now know they are essential for your holiday, but not just any binocular will do, you need the right one to get the most out of it. A good safari binocular will need to be ideal for general wildlife observation, be above average for birding and be great for travel. This they need to combine many of the strongest features from birding, hunting and travel binoculars. Even though the safari vehicles are pretty comfortable these days, you are bound to drop them or bash them Gaines something at some time during your holiday. Remember you are also going to be traveling about and so a flimsy pair could easily get damaged. So look for a pair that has a tough rubber armor covering and comes with a good quality and protective carry case. If you are going to be walking about in the bush, another tip is to look for a pair that has their objective lenses set back quite deeply within the body. This will protect them from getting damaged or scratched when walking through and around thick bushes. Failing that make sure your optics come with some good objective lens caps that fit well and that can be tethered to the body so you can easily cover your lenses when required without having to look through your bag for them. Unless you want to struggle around with tons of luggage everywhere you go, it only makes sense that the optics that you travel with are as compact as possible. An easy to carry and compact binocular is even more important if you are planning on going on walking safaris and is especially important if you want to carry your camera with you at the same time as well. But compacts do have their drawbacks and so some people may feel that the benefits that full size or even mid-sized binoculars have over them are worth the extra weight and size. Because of their larger objective lenses full sized and even mid-sized binoculars are able to take in more light, meaning that all other factors being equal, the image that you view through them will usually be brighter and of better quality - Note: other factors like coatings and the quality of the lenses and prisms will also have a big baring on this. On a bright sunny day, the image brightness will not be a problem even with very small compacts and is only really and important factor in poor light conditions. On safari you may go out very early in the morning or late in the afternoon and early evening, when it is cooler and most wildlife is more active. The problem with this is the light quality will not be at it's best and it is at these times where a binocular with larger objective lenses will perform better than a smaller one with the same quality glass and coatings. Having said that, if you choose a really good quality compact binoculars that use high quality glass and coatings, they will actually often outperform cheap or poor quality full sized binoculars and will work fine for most conditions that you encounter whilst on safari. If you are looking for a very cheap pair of binoculars (please don't!) I would suggest opting for a full sized pair of porro prisms, but if you are able to spend just that bit more, you could easily get the same performance from a compact porro prism that is far easier to carry around whilst on safari and when travelling. At the same magnification full size binoculars tend to have a wider field of view, which as you will see below is a fairly important feature for racing binoculars. If you want a better performance than a compact can offer, but don't want to carry about a full sized pair of optics, you should consider a pair of mid size binoculars which offer a great compromise between the two. On walking safaris I tend to use my compact binoculars, but if you want a better performance than a compact can offer, but don't want to carry about a full sized pair of optics, you should consider a pair of mid size binoculars which are a great compromise between the two and are in my opinion are an ideal size of binoculars for most safaris especially ones where you will be viewing the wildlife from a vehicle. Tip: When I am walking in the bush, I always have a pair of binoculars with me, but I also sometimes want to have my camera with me as well. Obviously on these walks a compact binocular makes sense, but what you really need is one that can fold away small enough to fit into your shirt or jacket pocket, rather than have it dangling round your neck where it can get in the way when you are trying to photograph something. When it comes to size, not all compact binoculars are created equal - look out for roof prism compacts that have a duel hinge design that makes them far smaller than standard single hinge or porro prism compacts when folded. 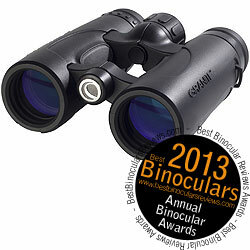 For more details take a look at my article on the Best Compact Pocket Binoculars. The next problem with high powered binoculars is that it becomes harder and harder to keep the image steady as any movement you make becomes progressively magnified through the binoculars. Image shake is a real problem when you have to follow something like birds or are using your binoculars for long periods of time like viewing animals at a watering hole where it is not only annoying but can eventually give you a headache. So with magnification you have to make a compromise between getting close enough to to really see the details, but not so close that it makes actually seeing what is going on difficult! 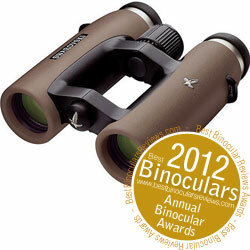 So in my opinion binoculars with a magnification of between 8x and 10x will is ideal for most safari binoculars. If however you are going to be particularly far away from the action you could consider a 12x magnification which is still fairly easy to keep still without a tripod and has a decent FOV, but will get you just that bit closer to the action. The field of view (FOV) of a pair of binoculars is basically the width of the image that you can see through the binoculars and so a wide FOV enables you to catch as much of the action all at once without having to move the binoculars about. For observing large relatively slow moving animals, a fairly narrow field of view is not really an issue. A nice wide FOV is much more important when observing small and fast moving objects like birds as a wide picture will make it far easier to spot them in the first place and then keep them in view as they dart about a tree or bush. So for a good general all round safari binocular used for both bird and large animal observation you want as big a FOV as possible but don't get too obsessive about it. A binocular's FOV is usually expressed in feet at a distance of 1,000 yards, but is you also find it expressed in meters at 1,000 meters or it is sometimes displayed as an angle. I would say that for safaris a FOV of 315ft at 1,000 yards (105m at 1,000 meters / 6.0° ) should be fine for most people, but as I say, the wider the better, so if you are undecided between two models, check which has the widest FOV. Waterproofing: A waterproof binocular is important especially if you are traveling in the rainy season (yes it does rain in Africa!) Most safari vehicles are not the most waterproof vehicles out there and sometimes some of the best game viewing experiences can happen when it is raining. On one occasion that comes to mind, I sat in the rain for over an hour with some hardy guests watching a cheetah shelter from the rain under a tree. We got very wet and so did our equipment, but it was well worth it to be able to spend such a long time observing this magnificent cat. Waterproofing not only protects your optics from moisture, but in dry dusty conditions that you will often encounter on safari it will also prevent any dust and other small debris from entering them that could easily lead to your view being spoilt. Image Stabilization: Image Stabilization Binoculars can really help if you definitely want or need a high powered binocular, or if you have particularly unsteady or shaky hands. Most work by using sensors that detect horizontal and vertical movement and a micro-pressor within the binocular that instantly adjusts the refraction angle of the incoming light on the prisms to cancel or smooth out the movement for a much steadier view. Do they work? Most definitely, but they also have their drawbacks - If you are looking for Image Stabilization, the best are the Canon IS Binoculars.